Barefoot. You read that right. Time to take your wine snob hats off, wineos, and prepare to be surprised. Say what you will about Barefoot Cellars because there's a good chance I'll agree with you for most of their stuff, but I enjoy their Moscato and Riesling. I have no shame in saying that. For a magnum of those varietals at $10 a pop you can't beat it. You should know by now, after almost two years of writing this blog, that I like to keep some perspective on what you're paying for and what you're getting. The wine snob in me is kept in check by my bank account. And guess what? Barefoot also does some pretty delicious value sparkling wine under their Bubbly line. 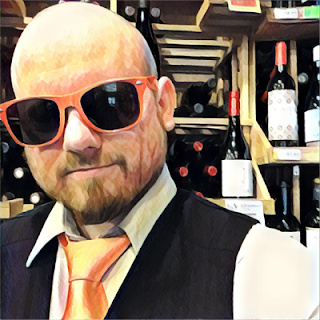 So when Barefoot approached me about reviewing their wines I was all about "Yo, dat bubbles tho" and they were all like "K" and hooked me up, no foolin. Then it just so happened that the stars aligned in my schedule for the days leading up to a time that's kind of a big deal for sparkling wine. 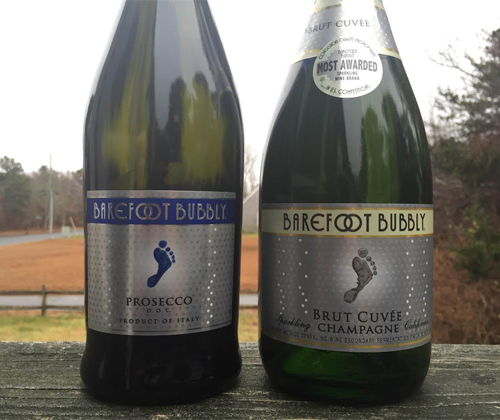 And so, leading into New Year's celebrations, I'll be reviewing four Barefoot Bubbly's in a two part series. I'll start off dry with Prosecco and Brut Cuvée, and then I'll move on to sweet with Moscato and Pink Moscato. So I'm in the middle of a struggle right now. I've got all this sparkling wine that was sent to me with the intention of reviewing. And my wife just bought a bunch of pre-sliced cracker cheese AGAIN. I swear it's an attempt to get me fat again to stop being so handsome to all the lady competition. 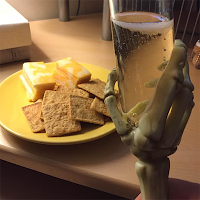 I'm a cheese addict and I would love to just down a ton of bubbly with cheese and crackers. Oh my freakin gawd that would be absolute heaven. Well played, Jessica. Well played. To review in a serious manner or shove my face full of cheese and wine while watching Ash vs. Evil Dead. To cheese or not to cheese. Whether 'tis nobler in the mind to cheddar or to take arms against a brie of troubles and by opposing end them. To wine... to drink... alright, enough. You get the point. And you can all gouda hell. There's no getting around putting that Prosecco name on the label, unlike a certain something something from the next review. This is sparkling Glera from the Prosecco region of Italy, and Prosecco right now is the most popular sparkling wine in the world. It's fermented and secondary fermented in big stainless steel autoclaves, making it crisp and appley as opposed to the yeasty and breadiness of sparkling wines done in the Champagne style. It's more frothy and frizzante than fully sparkling. It took awhile to get the head to calm down a bit because I didn't have a chill pill readily at hand. The color of the wine is a really pale straw yellow. The nose is very floral and for some reason it brings me a picture of white flowers specifically to my head. There's also aromas of agave, apple and sea salt. What the hell is agave? It's the plant they use to make tequila. Now that I said it you'll totally get it. TEQUILA! The palate is the same as the nose, minus the sea salt but bonus some really aggressive peaches. 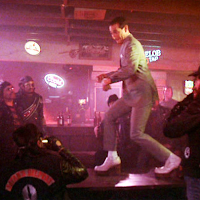 Those peaches keep chasing you right into the peachy finish. You and I both saw Champagne on that bottle, right? Champagne is a protected name and only wine from the French region of Champagne that follows the laws of Champagne can carry that name, right? Pffft. This is 'Murica, dummy. Here we do what we want. To be sold in the European Union there are only a handful of US wineries that are grandfathered in to use the word "Champagne" on their labels, and even then they need to say "American Champagne" or "Californian Champagne". Most of those guys don't take advantage of that and just say "sparkling wine". But if you're not going to sell your schtuff in the EU then you can just cowboy up. That's how Franzia and Carlo Rossi get away with making "Burgundy" and "Chablis". Barefoot does choose to state quite clearly that this "Champagne" is from California, though. On the label it even states that secondary fermentation was done with the charmat method, which is the same way Prosecco is made: big tanks instead of in individual bottles. But when you think about production size that's not surprising. The difference should be the places and grapes involved, and some extra time in contact with the lees (dead yeast) after the fermentations are done. By the way, I broke into the cheese. Ricotta be kidding me if you didn't see that coming. It's so delicious that it's hard to stay sharp and remember that I'm stilton a wine review. Wheel move on. There are more bubbles and they're larger than the Prosecco. It's almost the same color but a tiny little bit of a darker hue. There's apple, pineapple and graham cracker on the nose. The palate is dry and crisp and appley, with notes of lime and wheat, and finishing with spicy ginger. I would prefer to offer up a Spanish Cava, but I wouldn't stop somebody from buying this. And if somebody was pouring it for me I wouldn't stop them, either. It's a solid sparkling wine that does right for what it should be. It exceeds its targeted consumers expectations and defies its haters expectations. But still, as I stated, for the price I'd still prefer a Spanish Cava.